Reza, you'll travel to Zloty Tur not at first. How do you feel about the upcoming event? What motivates you to come there? – I'm super excited about the Zloty Tur this year. The level of competition just continues to get higher. What motivated me to come to Poland for the Zloty Tur this year is the opportunity to beat some of the Kazakhs, kids that beat me last year. As well I will be cam reffing the matches during the semis and finals. Tell, please, about your preparation? Whom do you consider as the most difficult rival? What result do you expect? 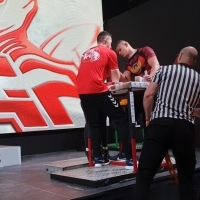 – As for my preparation, I've been doing a lot of heavy isometrics and repetition work outs, pulling with my team mates, as well as local tournaments. But what I feel differentiates me from last year is I now know what to prepare for. Last year I really had no idea of the directions or moves my opponents would go. This made me over analyze I feel in the set up leaving me to not focus on my hit as much. As for rivals. I’d really like to get a win on any of the guys from Kazakhstan and Georgia, this is my goal for this year. As for placement. I'd love to be top three but it’s all about the brackets. Last year my first right handed match was a crazy battle with a Japanese puller and he exhausted me with his kings move. After the match I only had about 3 mins to recover. I was on the A side of the bracket. so, my second match was against one of the Kazakh kids and he easily beat me because he flashed his first opponent and really didn't waste any energy in flashing me due to my fatigue. So it’s all about the brackets when it comes to such high caliber events. - Couple of words about Vendetta pairs. How do you think, who will win and why? The vendetta matches Should be some of the most awaited matches we've had in the arm wrestling community for a long time! Rustam vs Todd - I feel this match is a hard one to predict because they both haven't pulled each-other in some time. Yet personally. I'd like to see Rustam win and as an American I’d like to see Todd win. So my opinions pretty split on this match. Dmitry vs Dave. recently Dave Chaffee had a win over Travis Bagent. With this in mind Dmitry should have his hands full. I guess that this match will be in Dave Chaffes favor 4 or 5 to 2 or 1. I feel if they do get locked up in a rigorous match Dmitry with all his mass gains could get blow up and not have the endurance to beat Dave. Both are power houses so this to me is actually the best match of the event!!! Andrey vs Michael. This match should be interesting. We all know Micheal has crazy endurance in the kings move and we also know Andreys hit is only comparable to a Travis Baggent style hit. My question is. Will Michael have the power to simply stop Pushkar's hit? or will Pushkars hit be unstoppable. I feel Pushkar may win the first few matches and after Michael catches him it will lean into Michael's favor either leaving us with a 4-2 in Michael's favor or a tied match. Dawid vs Eduardo. This match should be fun to watch, I feel Dawid will win. Don't really have anything to say because there both actually really close in abilities. But it’s possible with Eduardo focusing on the new ZT Brazilian league that he’s not as focused a Dawid is. 5-1 Dawid. Genadi vs Tim. This match is all about Rims ability to catch. Can Tim catch him? No prediction on this match. Zloty Tur, 2001 - The birth of the stars! Marcio Barboza at Zloty Tur!